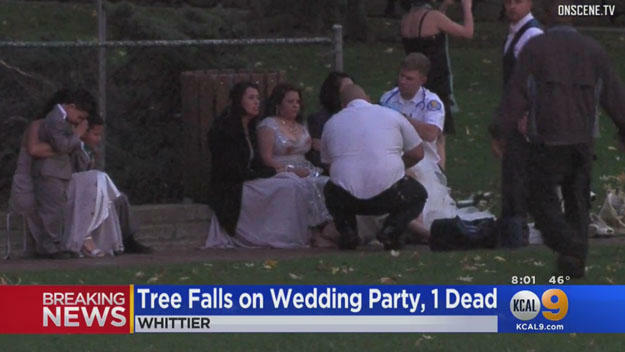 WHITTIER, Calif. - A 61-year-old woman killed when a tree fell on a wedding party at a California park Saturday has been identified as the mother of the bride. The Los Angeles County Coroner’s office has released the victim’s name as Margerita Mojarro, of San Pedro. Family members and friends confirmed to KABC-TV and KNBC-TV that Mojarro was the mother of the bride. The group headed to Penn Park in Whittier just after the wedding to take pictures. The group was posing for photos when a large eucalyptus tree uprooted and crashed on them. Several people were trapped under the tree and a 4-year-old girl suffered critical head trauma. CBS Los Angeles reports that Whittier officials said there has never been an incident with trees like the one Saturday. City Manager Jeff Collier said tree experts who work for the city inspected the trees Friday and Saturday morning after the heavy rains and wind on Thursday and found nothing wrong. Officials noticed a slope near the tree that fell that may have gave way. They will also continue to look into whether drought, wind and heavy rain was the cause. The park has been closed indefinitely while the investigation continues.